Happy Tuesday, y’all! Blogger Tip Tuesday is back and today we’re talking about Google AdSense. 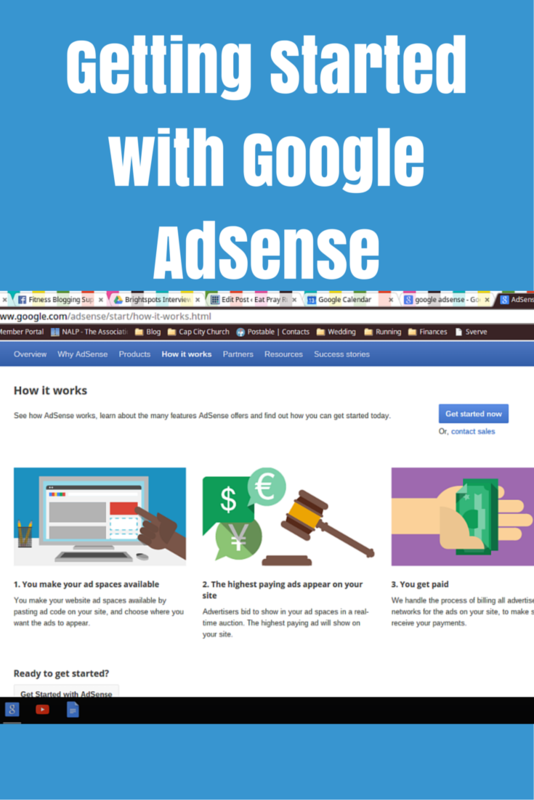 If you are thinking about monetizing your blog, you might want to start with Google Adsense. It’s fairly simple to use and easy to install and not hard to understand. In just a few quick steps, you can step up an ad or two on your blog. If you have a google account, a blog and a postal address, you are all set to get started. Once you sign in with your google account, you will answer a few questions about your blog (basic stuff) and then you will fill out an application. It’s very simple and the whole process won’t take very long. I recall that I was approved within a few hours of submitting my application. Once you are approved, you will need to create a new ad unit in order to start making money. You can choose the size of your ad and as you can see above, I have one sidebar ad that is 300×250. After deciding on the size and placement of your ad, you will generate an ad code. All that means is that there will be HTML code that will need to go on your site in order for the ad to work. Since you are probably not an expert in HTML code (I am NOT), you can use a plugin to do this. I suggest WP Simple Adsense Insertion. Once your code is inserted, give it a few minutes (or a couple hours – sometimes it can take awhile) to get loaded up and then your ad will be visible. Remember how you put in an address when you set up your account? Now go in there and change your payment method – you don’t have to do this, but it is probably easier to just set it up for your payments to go directly to your bank account. You can do this by logging in to your AdSense account and clicking on “view payments” on the top right corner on the home page. There you can manage how you get paid. You will note that Google only pays once you reach 100 in earnings. For me, this took quite awhile. The fact is you won’t get rich off of Adsense unless you have a LOT of pageviews. However, it’s a good way to experiment with ads and see if ads are right for your blog. 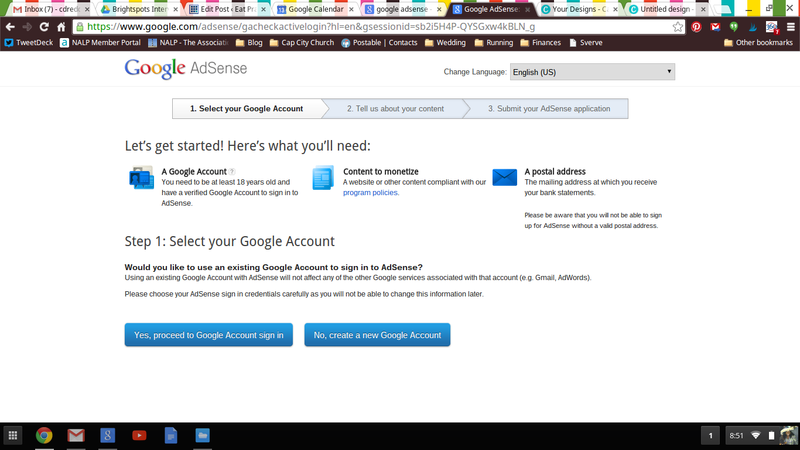 Do you use Google AdSense? Very helpful! I want to get into monetizing sometime this year, though I am still worried about cluttering my page since I don’t get a lot of pageviews yet. I understand the logic behind bloggers wanting to make money with ads on their blogs, but I’m still having a difficult time coming to terms with making such a shift with my blog and adding ads since it is so far from why I started blogging. Not wanting to use ads is one of the reasons why I haven’t made the switch to a self hosted platform yet. I’ve been hesitant to do this bc I am not sure I want ads. Do you have any approval over the exact ad that will be there? Thanks as always for your tips I do appreciate them. You can block certain categories of ads with Adsense. You should play around with it (you can see all the options without actually putting the code on your blog). We don’t have ads on our blog because of the decision to not monetize the blog. However, I find ads to sometimes be a distraction when there are too many on a page. I have never noticed them on your blog!! Thanks! Something else to consider! I’m not sure if I’ll ever get to the point where I want to put ads on my blog (I’m a long way from that In any case) but I’m definitely going to tuck this info away for later. I actually went back to the post where you explained how to disable comments on a specific post yesterday and it did the trick, so thanks for that! I have always used Chitika but I am so irritated with it lately- definitely thinking of switching to AdSense and this confirms it’s time! oh i’ve never heard of chitika but adsense is super easy to get set up and i’ve never had any problems! 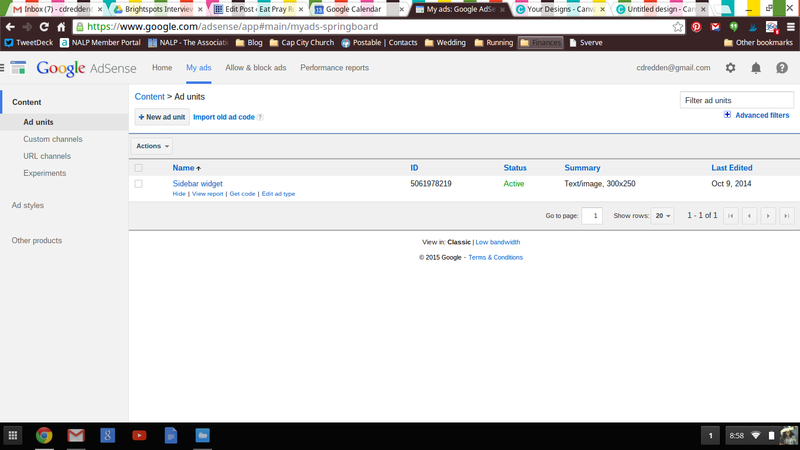 I have AdSense, but find I make very little from it compared to Ad Networks. I just noticed my first comment earlier today never went through. I like that ad sense helps us with the cost of hosting/domain name. So far I haven’t had a problem with it. I have always felt the ads are appropriate for our site, but then again, I do believe each reader sees a different ad based upon what they have been searching for on the internet. At least I have found that to be the case. yes! i just said the same thing to someone else (about them being tailored to the reader of the blog). thanks for chiming in! Thanks for this Courtney. I’ve been hesitant to go the ad route only because I worry about having control over the types of products advertised. yeah, you can control categories but not individual ads. however, the ads take into account things your users have searched for (google knows everything) so i haven’t had a problem so far. Haha, it took me awhile as well! I’m still ad-free but pinning this in case I change my mind! I recently installed it onto my site, captivatingcorner.com. But how do you know if it was installed correctly? I know that you cannot click and check on it yourself. If you see ads on your blog, then it’s installed correctly. Hi Courtney, thanks for the blogging tips! I have applied for google adsense a couple times and keep getting denied. Do you have to be self hosted? Is there something I am missing? Im a runner and love following your blog! Hi Alia. Yes you have to be self hosted to do this (or make any money w/your blog). Good luck!